A Mass celebrating the life of St. Martin de Porres drew Catholic faithful from across the Archdiocese of Philadelphia on Friday night, Nov. 3 to St. Athanasius Church in the city’s West Oak Lane section. The 55th annual event that is coordinated by the archdiocese’s Office for Black Catholics welcomed Archbishop Charles J. Chaput as the celebrant and homilist for the Mass. Among the 500 who filled St. Athanasius’ upper church were a strong showing of children and young adults. Their presence was coordinated by Franciscan Father Richard Owens, the new director of the Office for Black Catholics. He said his aim was to get as many of the young people involved as possible, since they are the future of the church. “From a director’s standpoint there were as many young adults as I had hoped,” Father Owens said. “We had seven of the Mitchell scholars who participated as readers and other parts of the liturgy. The young population was involved in the planning of the liturgy as well. “This was truly a celebration of our Black Catholic identity and the life of St. Martin de Porres. It took a lot of planning and I received quite a bit of help. Father (Joseph) Okonski (pastor of St. Athanasius) was helpful and so were the members of the parish,” Father Owens said. The opening processional featured the Mitchell scholars carrying banners down the aisle that led to a statute of St. Martin de Porres standing in the middle of the sanctuary. The students are recipients of the John Mitchell Scholarship Fund, an endowment earmarked for outstanding African American Catholic high school students attending Philadelphia archdiocesan schools. The fund was established by the late U.S. Naval Captain Dolores Cornelius. 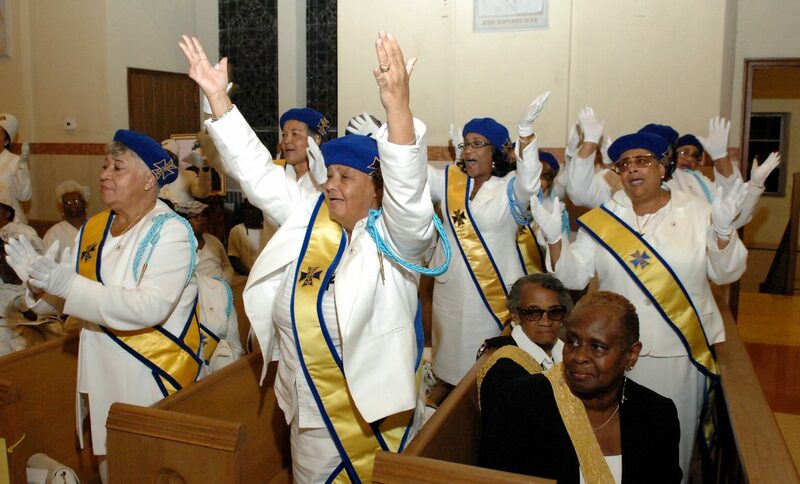 As the scholars processed to the opening songs, “Let it Rise” by William Murphy and “Total Praise” by Richard Smallwood, the voices of the Philadelphia Catholic Mass Choir, under the direction of Kenny Arrington, filled the church. Among those in the procession were the Knights of Peter Claver and the Knights of Columbus. The priests present included Father Rayford Emmons of Holy Cross Parish, Father Okonski of St. Athanasius, Father Christopher Walsh of St. Raymond, Father Sylvester Peterka of St. Vincent de Paul and Father Stephen Thorne of St. Martin de Porres. Deacon James Mahoney of St. Athanasius and Deacon William Bradley of St. Raymond assisted at the altar. “I could wish that I were accused for the sake of my own people,” said Sade Taiwo, a Mitchell scholar and student at Hallahan High School, during the first reading from Romans 9. In his homily Archbishop Chaput stressed that St. Martin de Porres gave his heart to the poor and the deprived. He stressed to the young people that one can use St. Martin as an example, since he developed his spirituality at an early age. 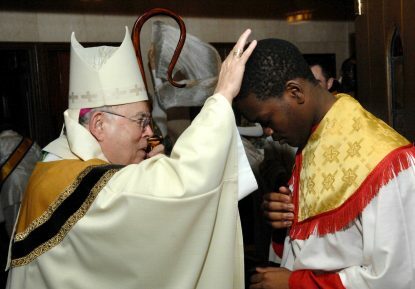 “Holiness is not just for older people,” Archbishop Chaput said. He added that one does not have to have a pristine background to become a saint. He said that in his 16th century society St. Martin was looked down upon because he was born out of wedlock and poor. Yet he, like many who are in local parishes today, was an ordinary person who did extraordinary things. “We are to be holy and set that example,” Archbishop Chaput said. “Holiness creates unity.” He added that racism has no place in the church, and all are called to love one another. Archbishop Chaput then presented the St. Martin de Porres Medal to philanthropist Cynthia Brown. 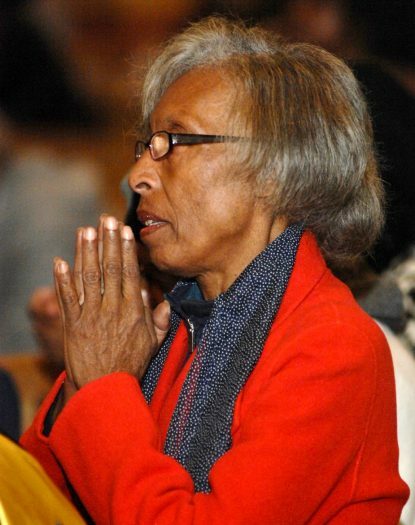 She is a member of Our Lady of Hope Parish in Philadelphia and a member of the Ladies Auxiliary of the Knights of Peter Claver at St. Athanasius Parish. “The anticipation of this award has brought me motivation and gratification, reminding me that hard work always pays off and that I can do more,” Brown said. St. Martin de Porres was born in Lima, Peru on Dec. 9, 1579. He garnered a reputation for being a social justice advocate for the poor and those of mixed ethnic heritage whom he served selflessly. Although never ordained a priest, he was a member of the Dominican order. Canonized by Pope St. John XXIII in Rome on May 6, 1962, St. Martin’s feast day is Nov. 3. He is the patron saint of African American Catholics, mixed-race people, innkeepers, barbers, and public health workers. I say a novena to St. Martin for the care of Saint Martin de Porres school. God Bless their children.